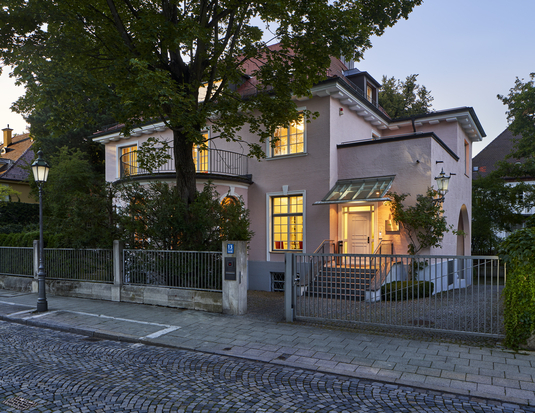 The Center for Advanced Studies is situated in an impressive villa built around the turn of the 20th century in the historic and central quarter of Schwabing, which has been a popular magnet for intellectuals from that time on. Famous sociologist Max Weber, for example, lived nearby. During the 1950s and 1960s, the house was the residence of philosopher Ernesto Grassi. Grassi was a full professor at LMU and founded the "Centro italiano di studi umanistici e filosofici" in 1948 – today the "Institute for Renaissance Intellectual History and Renaissance Philosophy". Grassi was also known as editor of the book series "rowohlts deutsche enzyklopädie". Today, the villa's spacious rooms are used for lectures and conferences as well as smaller meetings. The house also provides Visiting Fellows with workplaces. Its proximity to LMU institutes as well as to the university and state libraries also makes it an ideal location for intensive research as well as for inspiring academic exchange.